We use structural aluminum for all type of applications, including custom workcell framing, mounting, support systems, brackets, connectors, guarding, etc. In addition to using structural aluminum in various ways for our automation systems, we also provide it as a stand alone product. We offer various types of structural aluminum bar stock in any length up to 12′. 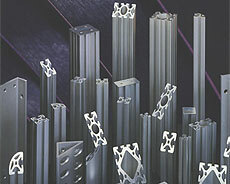 We have a wide variety of bar stock profiles readily available and we have a catalog available upon request. Our custom cut structural aluminum can be cut to a desired length +/-0 .005″. We can custom cut orders to customer specifications and angle requirements. A large selection of brackets are also available in various shapes and sizes. Using Dial-Xtrusion (Dial-X Automated Equipment, Inc. manufactured/custom cut structural aluminum) saves engineering cost and construction time. In addition, structural aluminum products are stronger than steel, while being more lightweight and easier to use. For further information or a free quote on structural aluminum, contact Dial-X Automated Equipment, Inc.